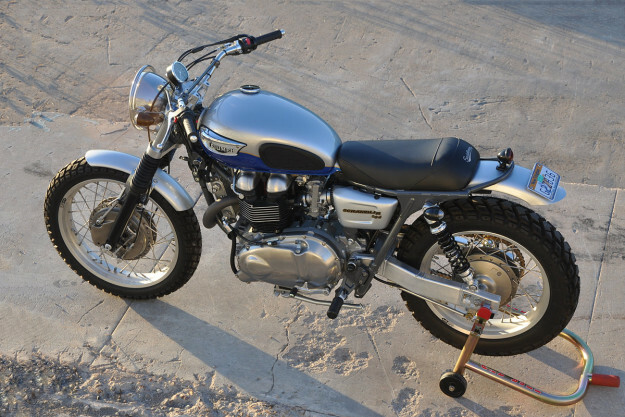 Always a risky business speaking for the Celebrity Dead, but is there any doubt that if Steve McQueen were still among us, he would own one of these, the latest retro Triumph Scrambler to emerge from Richard Pollock’s Mule Motorcycles workshop? At the very least, the Hinckley lump’s knee-friendly electric starter would be greatly appreciated—as the King of Cool would be a slightly decrepit 85-year-old were he alive today. 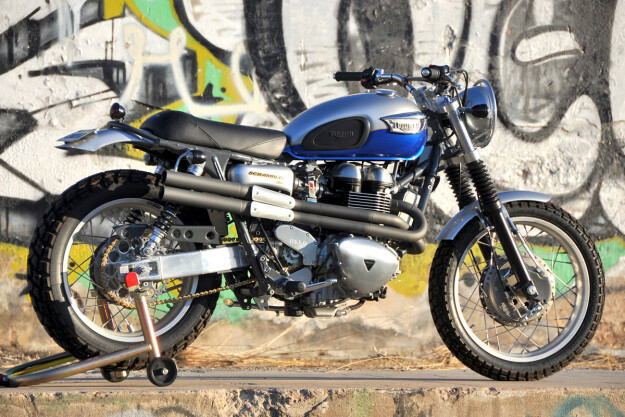 West Virginian Sean Hutchinson, who commissioned the Triumph’s build, is considerably younger with no ligament issues, but wanted something that evoked McQueen’s days of gunning desert sleds across the wilds of the Mojave. With that directive, Pollock ordered up a Triumph Performance USA 904cc big-bore kit, hi-po cams and headwork, along with billet intake manifolds, Keihin FCR 39mm carbs, and a new ignition unit with modified advance curve and raised rev limit. 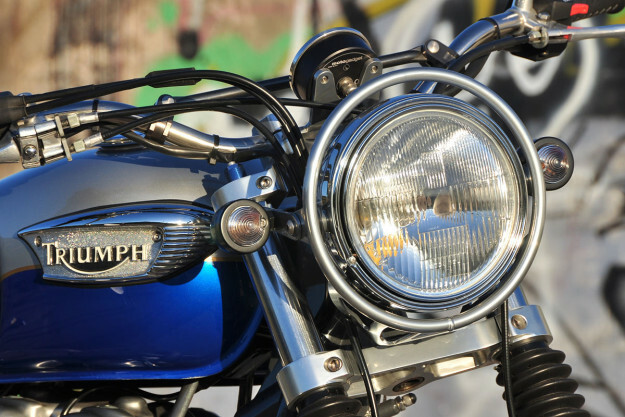 Up-pipes inspired by those on Honda’s old 305 Scramblers finish off the combustion process. Chassis mods came next, led by a set of highly modified early Yamaha YZF-R6 forks. 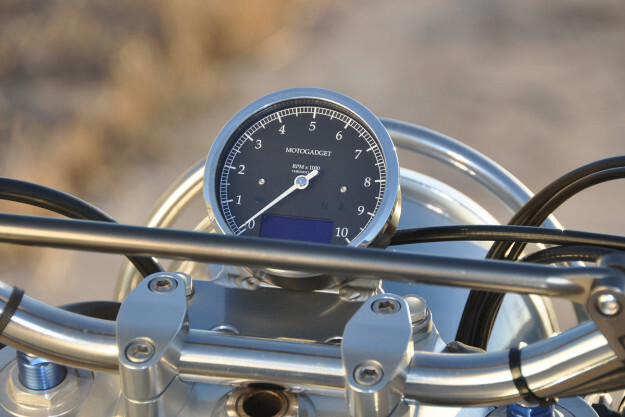 Mule billet drop-top triple clamps hold the fork tubes in position and provide a perch for the Motogadget Classic speedo/tach. 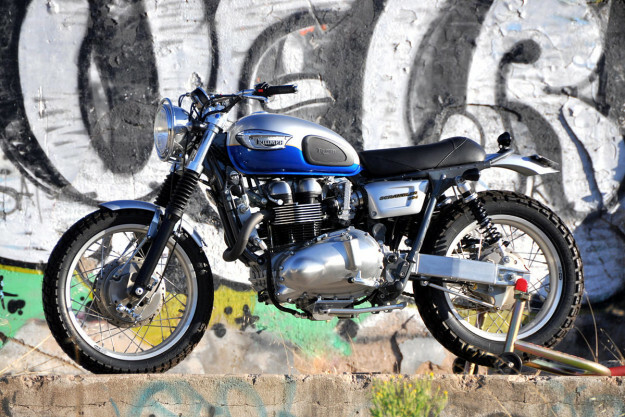 Because a solo saddle was an important part of the scrambler script, a bobbed rear frame loop was welded on out back. The custom Sixties-look seat was stitched up by Saddlemen to Pollock’s specs. From the Mule Motorcycles catalog came a set of stainless flat-track handlebars, with a Renthal crossbar robbed from Richard’s own personal MXer. Also from Mule’s product line are the abbreviated front frame downtubes, a setup that works well with Pollock’s vertically mounted oil-cooler kit. 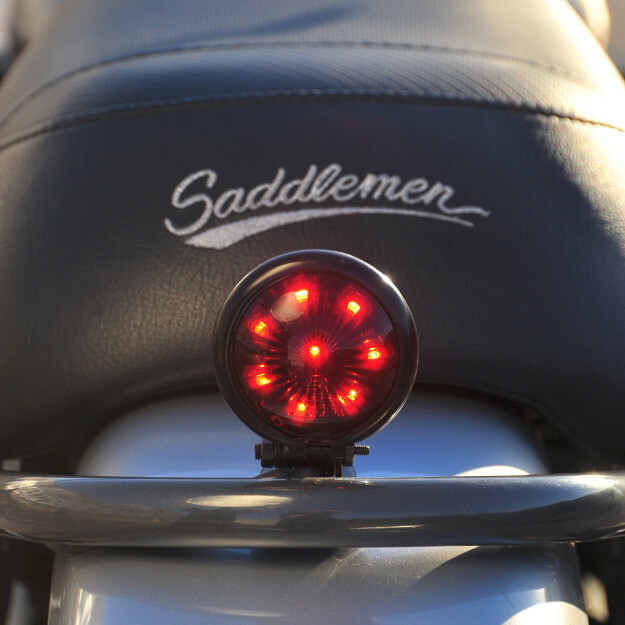 A Baja-style mounting ring holds the stock Bonneville headlight in a well-protected position, while a classically tiny LSL taillight hides eight bright LED bulbs. 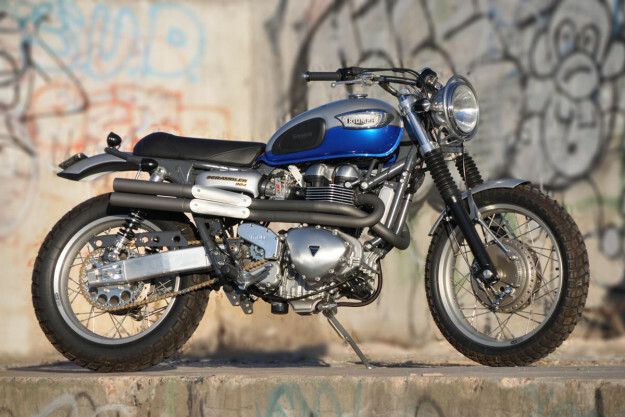 Shorty aluminum fenders front and rear were painted silver to match the top of the two-tone gas tank, while a 19-inch Sun aluminum front rim and 18-inch rear were shod with suitably meaty-looking Heidenau K60 Scout dual-sport tires. One chassis detail hard to miss is the oversized, ultra-stiff aluminum Mule swingarm working through stout adjustable Racetech shocks—no flex here! 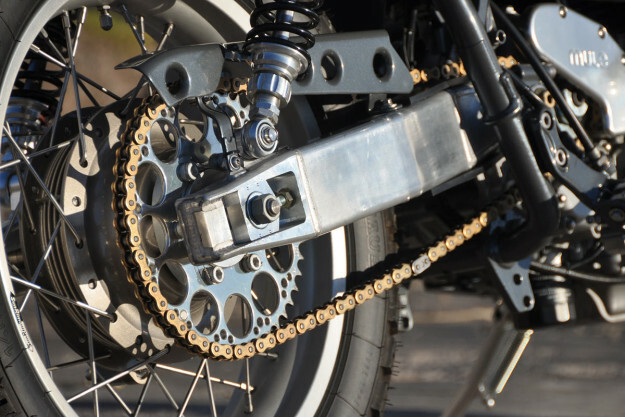 Pollock sold Hutchinson on the concept of retro-looking drum brakes, but the owner was adamant that the binders needed to match the performance of the bike’s breathed-on motor. So Pollock sourced a four-leading-shoe, twin-air-scoop front hub from a 1972 Suzuki GT750, a popular choice for roadrace duty back in the 1970s and a favorite of café racers today. The brake was treated to a complete restoration, including being bored for larger bearings, and in a nice doubling up of tasks the twin brake stays morph into the front fender mount. 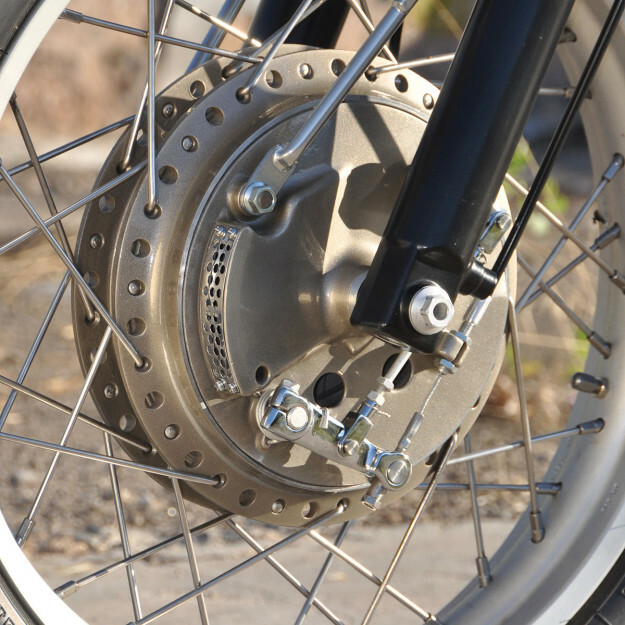 Rear hub is from a 1976 XS650 Yamaha and has had a similar larger-bearing treatment, along with a Swiss-cheesed aluminum sprocket. You don’t need to pull Steve McQueen money in order to afford one of Mule’s massively massaged scrambler specials (even in death, the actor rakes in a cool $9 million a year in royalties), but then again it doesn’t hurt. Figure about $35,000 if you want one just like it.